I have always been fond about horses. In grade 4 my mom took me to a horse camp and that was when I knew I loved horses so I started studying them. 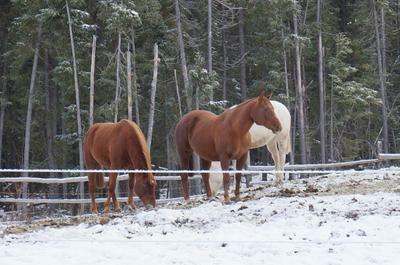 In grade five I found a stable about ten minutes out of my home town. For a while the person I worked for had 5 horses a welsh/quarter horse, 2 quarter horses and 2 shetland ponies. Now I take care of 3 horse for the same person a quarter horse mare named Lady,she is the lead mare,she is chestnut and she is 14. A welsh/quarter horse mare named Baby,she is 4,and she is white (not gray she has a pink nose). And my favorite horse of all is a quarter horse mare named Dejay, she is sorrow, and 5 years olds. I still study about horse and I want to be a horse vet when I am older. I go to an equestrian camp now in North Dakota. I have a massive collection of model horses,stables ,tack ,vet equipment etc. I really want a horse of my own. And my favorite breed and color of horse is Anglo-Arab, dapple gray.